From sending snail mail using an app to serving as a home security system, modern smartphones can just about do it all. 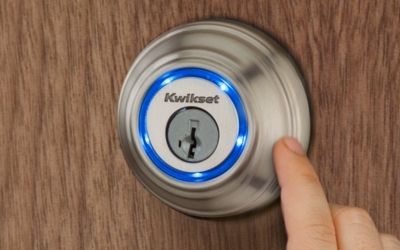 Now, Kwikset wants to turn your smartphone into a key with the Kevo, a Bluetooth-enabled remote door lock operated by your iPhone. With the Kevo, so long as you have your smartphone on you (or an optional keyfob), you’ll be able to open your front door just by tapping it with a finger. You don't even need to take your phone out of your pocket to do it. Four AA batteries are needed to power the lock, though you can always open your door with an old-school key, no power required. Of course, unlocking your own door with your phone is a novelty – the real benefit of Kevo is being able to let other people use their phones to do the same. You can send a permanent electronic key to members of your family and trusted neighbors or you can create a special one-time-use eKey. Kevo can track who uses their keys and when, sending push alerts to your phone. For now, the Kevo app will only available for the Apple iPhone 4S and 5. The price and launch date have not been set.